When I signed up to run the Madrid Marathon, I was aware that Madrid was likely to be pretty hot in April, and the course was far from flat. Most marathon websites have a map of the course - this one had a map, but also an altimeter! This fear of a gruelling few hours in the Spanish capital spurred me on to undergo some very wintry runs in the early months of the year. The training became easier and more determined as more and more kind friends and family donated to APP. I was then made aware of the charity fund-matching scheme of my employer, Jardine Lloyd Thompson (JLT), so with JLT and many friends backing me to finish the pressure was on. Feeling fit and healthy, my support crew (my wife Georgina) and I boarded the plane to Madrid on Friday 26th April, and for the first time in many years I steered clear of the tempting complimentary beer and wine that were on offer. The weather for the big Sunday ahead was forecast to be unusually cold, so whilst Georgina was disappointed that sunny sangria sessions were off the cards, I was delighted and relieved. The Sunday morning arrived, and after porridge and bananas, and a Mars bar to boot, I was stocked up and ready for the run. 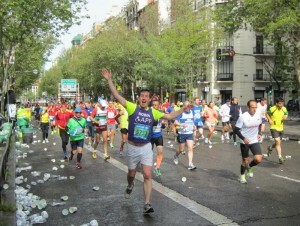 I set off across the start line and began the climb towards Real Madrid's famous Santiago Bernabéu Stadium. The atmosphere was fantastic, with the course lined with well-wishing supporters. The numbers of participants had soared since the tragic events in Boston two weeks beforehand, and spectators were similarly enthusiastic to demonstrate solidarity and support. As I chipped away at the 26.2 miles, my thoughts were constantly with those who had sponsored me and wished me well, the work and raison d'être of Action on Postpartum Psychosis, and those who have been affected by severe post-natal mental illnesses. 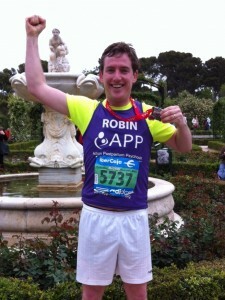 I was immensely proud to be running with an APP vest on. The final few miles of the marathon seemed to be all uphill, and I was absolutely exhausted as I crossed the finish line after 4 hours and 3 minutes. Countless people who have supported the charity through my webpage, and otherwise, have commented on what an excellent cause I was running for, so the aches and pains felt more than worthwhile. I would like to say a huge thank you to all those who supported Action on Postpartum Psychosis, together with Jardine Lloyd Thompson who very generously matched the total I raised.